With a deep-rooted tradition and history in Ireland’s dairy industry, our vision is to be a top 20, global, farmer-owned co-operative who supply natural, sustainable and innovative dairy produce that nourishes people all over the world. Our mission is to nourish people around the globe with our naturally-sourced gold standard dairy ingredients from the most fertile farmlands in the world. We will maximise our shareholders’ values by fostering relationships with key partners, and growing our culture of sustainability and innovation. Our values are led by our deep-rooted tradition as a rural, community-oriented co-operative of hardworking farmers and families. Everything we do comes from that grassroots focus on quality, honesty and community. 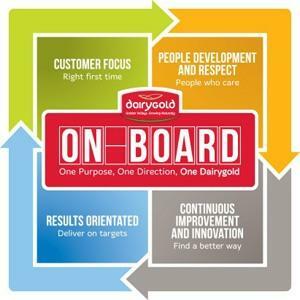 These values allow us to build and maintain long-term relationships with shareholders, customers and employees. We focus on customer satisfaction and people development within our organisation by continuously improving our co-operative through innovation and quality-assurance.